An unknown assailant shot six street dogs in Rayong’s Mueang district on Monday, causing four of the dogs to hide before they were rescued the following day. On Monday, local resident Supattta Isamael told police that she had found one dog that had died from its injuries and another wounded, while four dogs had disappeared. The six canines were street dogs living in a deserted housing estate in Tambon Nong Bua. Supattra said one of the four missing animals was a mother dog, which had abandoned its six recently born puppies. The dog had given birth in front of her house, so she had to feed the abandoned puppies, she added. Police found three spent shotgun shells at the scene of the shooting. On Tuesday, local residents joined hands to search for the injured dogs and found two of them, including the mother dog. They took them to a veterinary clinic for treatment. 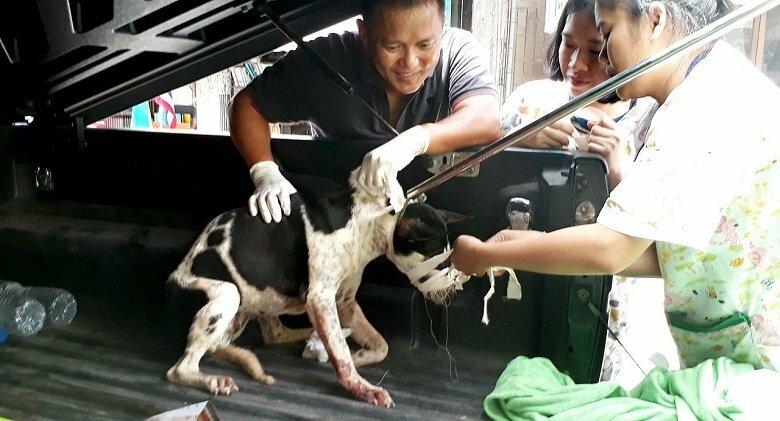 The vet, Sombat Ampol, said the first dog that he had treated, on Monday, had a pellet in its stomach, which he removed. He treated the wound and put the animal under close watch. The vet said the mother dog had suffered a broken left hind leg, while its right foreleg required surgery to remove a shotgun pellet. The third dog had suffered a broken right foreleg and wounds on its three other legs, along with possible internal injuries, Sombat added. Jumpol Poonnern, chief of the None Phra rescue operation centre, on Tuesday said public support would be welcome towards the medical fees for treating the three injured dogs and for the milk for the six puppies, as their mother was currently too badly injured to feed them. So who on TVF has a shotgun? the Lone Falang rides again. This is ridiculous and absolutely cruel. How could someone be so evil as to go round shooting defenseless animals. This person needs to be found quickly and be educated that it is the people that think dogs are human (or better than human) who need to be rounded up and shot. The idiots who feed these stray mutts are to blame for the problem. Stop wasting ammunition on the result and concentrate your efforts on the cause.